The 2011 Polaris Sportsman® 550 EPS ATV is engineered for extreme off-road performance. 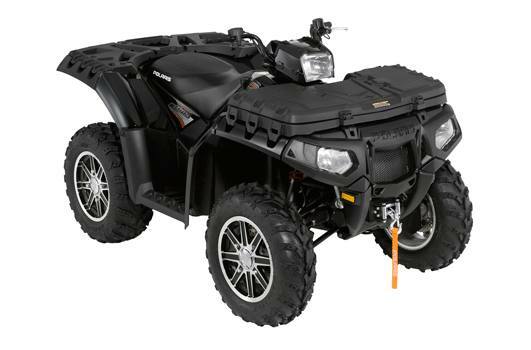 Ideal for trail riding, hunting, and is the perfect utility ATV. For 2011: larger fuel tank, tires and more. Legendary Smooth Rolled IRS: Years of innovation and relentless tuning have refined the ride to a level unmatched in the industry. Rolled Independent Rear Suspension (IRS) angles the shocks rearward for a smoother ride and less squat during acceleration. Ergonomics For Your Comfort: With the engine rotated 90 degrees, riders enjoy 33% wider floorboards and narrower vehicle width at the knees (3.25") and ankles. The narrower seat reduces leg fatigue and increases rider comfort. Electronic Power Steering (EPS): The smoothest, most responsive power steering available, with 30% more power assist than the leading competitor, plus Variable Assist for easier steering at lower speeds and greater responsiveness at higher speeds. Active Descent Control (ADC) And Engine Braking System (EBS): Work together to monitor and control downhill braking to give you optimum control and smooth, even deceleration during descents. On-Demand True All Wheel Drive (AWD): Still the best automatic 4x4 system out there, the AWD engages all four tires when the rear wheels slip and you need more forward traction. Reverts back to 2WD when you don't.